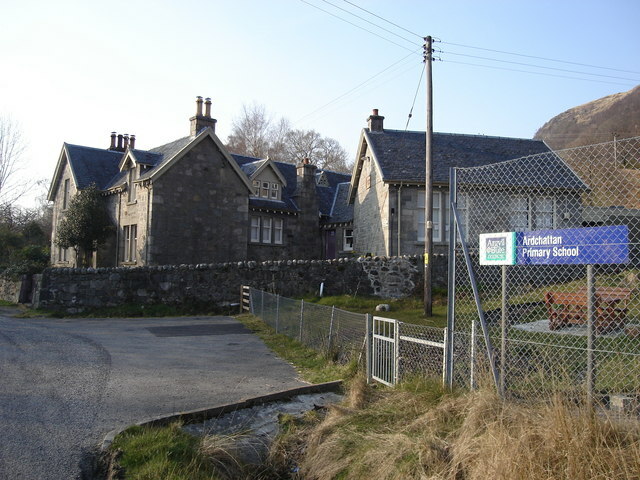 Ardchattan School at Bonawe was built in 1886 and closed in 2014. It originally had a roll of 14. It is a complex granite building, with the teachers house beside. It has two classrooms, an art area and general purpose room as well as an office, a separate canteen building and a large playground and garden area. The school has been the heart of the community activities for decades. ARDCHATTAN AND MUCKAIRN SCHOOL BOARD. §MR. CALDWELL (Glasgow, St. Rollox) I beg to ask the Lord Advocate whether it is the case, as stated by the School Board of Ardchattan and Muckairn, that they were compelled by the Scotch Education Department to erect the present Board school on a site between Kennacraig and Bonawe Quarries instead of at Kennacraig, which the School Board considered the more suitable site for the wants of the district generally; whether the Board school was built to accommodate, and is sufficient to accommodate, all children of school age in the district; whether the fact that the Department had informed those who had urged a site nearer the quarries that the Department would be prepared to take into consideration any claim for recognition which might be made on behalf of a voluntary school in such a position had been communicated to the School Board before the Board school was erected; and whether he is aware that the Episcopal school is only 600 yards distant from the Board school? §MR. J. P. B. ROBERTSON When the proposal to erect a new public school was before the Department, strong representations were made against the proposed site at Kennacraig, as being distant from the centre of population at the Bonawe Quarries. The views of both sides were carefully considered by the Education Department as constituted in 1883, and finally with some hesitation the Department sanctioned, as a compromise, a site between the other two. The Ardchattan Public School contains accommodation for 50, and this would not, if the representations made to the Department as to the number on the 9 registers of both schools are correct, be sufficient to accommodate all the children in the district. It was intimated to the objectors in 1883 that, although my Lords were unable to refuse sanction to the compromise, a proposal for a voluntary school would receive consideration. This intimation was conveyed, not to the School Board, but to those who were then urging the necessity of further accommodation at the quarries, namely, the lessees of Bonawe Quarries on behalf of their employés. I have no reason to doubt that the facts as to the distance between the two schools are as stated by the hon. Member. Do you have photos of the school or old pupil images ? Who were the teachers of the past ?